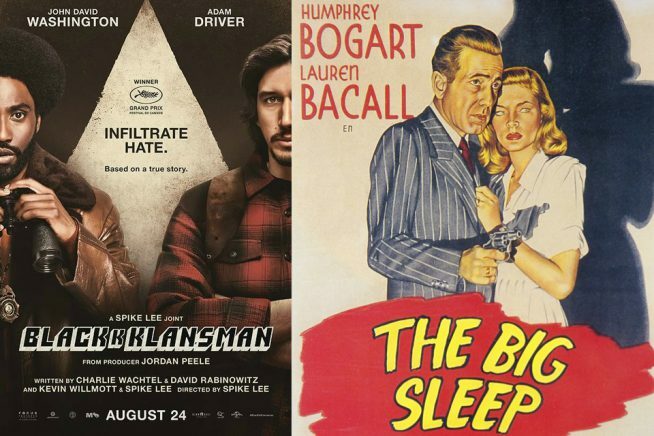 For Essex Book Festival, our friends at Epping at the Movies will screen three fantastic adaptations: BlacKkKlansman, Spike Lee’s masterful retelling of Ron Stallworth’s memoir; Big Bad Fox and Other Tales, a sublime animation for young audiences adapted from Benjamin Renner’s comic books; and The Big Sleep, the ultimate Raymond Chandler. Community Cinema at its best! Using the memoir by Ron Stallworth as a jumping off point, this Spike Lee joint follows the young African American police officer as he attempts to infiltrate the Ku Klux Klan in 1970s, Colorado. Nominated for a wealth of awards – and winner of the Cannes Jury Grand Prix – this biting comedy-drama is a provocative satire and a major comeback for the visionary director. This charming selection of stories for younger viewers is based on a series of French comic books and features a group of farm animals who put on three funny shows for the audience – The Big Bad Fox, A Baby to Deliver and We Must Save Christmas. Beautiful water-colour-esque animation and a great voice cast make this a must-see on Epping’s big screen. Featuring the voices of Adrian Edmonson, Bill Bailey, Celia Imrie, Phil Jupitus and Matthew Goode. + free Big Bad Fox poster for every audience member to take home with them after the film. PI Phillip Marlowe (Humphrey Bogart) is drawn into a twisting plot involving blackmail, violence and murder. Along the way, he meets the impressive Vivian Regan (Lauren Bacall) and sparks fly – but could she be too close to the crimes for comfort? Come along to Epping at the Movies and find out. Based on the novel by Raymond Chandler, this is the ultimate LA noir. Venue/Accessibility information - steps and lift access to auditorium. Front row level access. Step access to higher rows. EFDC Bakers Lane Car Park less then 3 min walk from venue. 10-15 min walk from Epping Tube Station. 5 minute walk from Epping High Street. Affordable refreshments available to buy at screening venue.